ACCUAIR I-LEVEL KIT UPGRADE FOR EXISTING ACCUAIR E-LEVEL SETUP. This listing is for a Brand New Accuair I-level Kit Upgrade for your existing Accuair E-Level Setup. This kit will only work with E-level Package (with sensors and arms) not with Accuair Speed Switch Controller. This kit must be installed as an upgrade to your existing E-level setup. A Free App is available on Apple Application website. Not Compatible with Window or Android platforms. Please note that this listing is just for an I-level kit. But I level can be added as an upgrade to E-level kit, E-level + VU4 manifold kit, Stage1 kit & stage 2 kit. AccuAirs iLevel provides wireless control of your e-Level Air Suspension System through an iPhone, iPad, or iPod touch. The app is available for free download through the Apple App Store and is designed to look and operate very similar to the popular e-Level TouchPad interface. Your mobile device establishes a password-protected WiFi connection through the iLevel WiFi Module to provide instantaneous wireless control and feedback from more than 100 ft away. 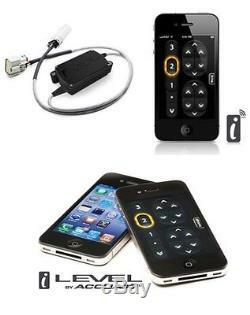 Offers full control over your e-Level Air Suspension System through an iPhone, iPad, or iPod touch. App is available for FREE download through the Apple App Store. Select or save from the e-Level systems 3 automatic height settings. Manually adjust the height of all four corners of the vehicle. Select the e-Levels "All-Down" function for parking. Intuitive system setup and selection of e-Level system features. Pop-up system diagnostics with helpful trouble shooting tips built-in. Fully operational with vehicle ignition ON and operates in "Key-Fob" mode with vehicle ignition OFF (allows 3 height and "All-Down" selection). "SmartSleep" function prevents battery drain for extended parking. Development of the Android version of the iLevel app is already underway and scheduled for release soon. Newmatics Inc is a family owned company, established in 2008. We are authorized dealer for all major Air Suspension companies in USA. We sell brand name parts from Air Lift, ASCO, AVS, Air- Zenith, Firestone, SMC, Numatics, Viair and Universal Air Suspension. We are located at 1832 Lone Star Rd, Mansfield, TX 76063. You can reach us at these numbers for any questions or better pricing as well as whole sale pricing. We are open to public in DFW area. Bermuda, Greenland, Saint Pierre and Miquelon, Brazil, Colombia, Ecuador, Falkland Islands (Islas Malvinas), French Guiana, Guyana, Paraguay, Peru, Suriname, Uruguay, Venezuela, American Samoa, Cook Islands, Fiji, French Polynesia, Marshall Islands, Micronesia, Nauru, New Caledonia, Niue, Palau, Papua New Guinea, Solomon Islands, Tonga, Tuvalu, Vanuatu, Wallis and Futuna, Western Samoa, Anguilla, Antigua and Barbuda, Aruba, Bahamas, Barbados, Belize, Cayman Islands, Costa Rica, Dominica, Dominican Republic, El Salvador, Grenada, Guadeloupe, Guatemala, Haiti, Honduras, Jamaica, Martinique, Montserrat, Nicaragua, Panama, Saint Kitts-Nevis, Saint Lucia, Saint Vincent and the Grenadines, Trinidad and Tobago, Turks and Caicos Islands, Africa, Andorra, Belgium, Bosnia and Herzegovina, Bulgaria, Czech Republic, Denmark, Gibraltar, Ireland, Latvia, Luxembourg, Malta, Moldova, Monaco, Montenegro, Romania, Slovakia, Spain, Sweden, Switzerland, United Kingdom, Brunei Darussalam, Cambodia, Indonesia, Laos, Macau, Vietnam, Afghanistan, Armenia, Azerbaijan Republic, Bangladesh, Bhutan, India, Korea, South, Kyrgyzstan, Maldives, Mongolia, Nepal, Pakistan, Sri Lanka, Tajikistan, Turkmenistan, Uzbekistan, Bahrain, Iraq, Jordan, Lebanon, Oman, Yemen. International Customers (including Mexico & Canada) Please Note. These charges are the buyers responsibility. We cannot under-value merchandise or mark the items as a gift on custom forms. Doing that is against U. All return items must be authorized and approved by us. Your feedback is very important for us. We will definitely resolve it. Please leave us a message and we will return your call as soon as possible. Powered by SixBit's eCommerce Solution. The item "Accuair I-Level upgrade For Your E-level Kit Air Ride Suspension Cars & Trucks" is in sale since Thursday, December 5, 2013. This item is in the category "eBay Motors\Parts & Accessories\Car & Truck Parts\Suspension & Steering\Lower Kits & Parts".